The skills that information designers possess are arguably the most important in the design industry. Without them we cannot understand new ideas, and if we cannot understand we cannot learn and if we cannot learn we perish. Our future depends on finding answers in data. 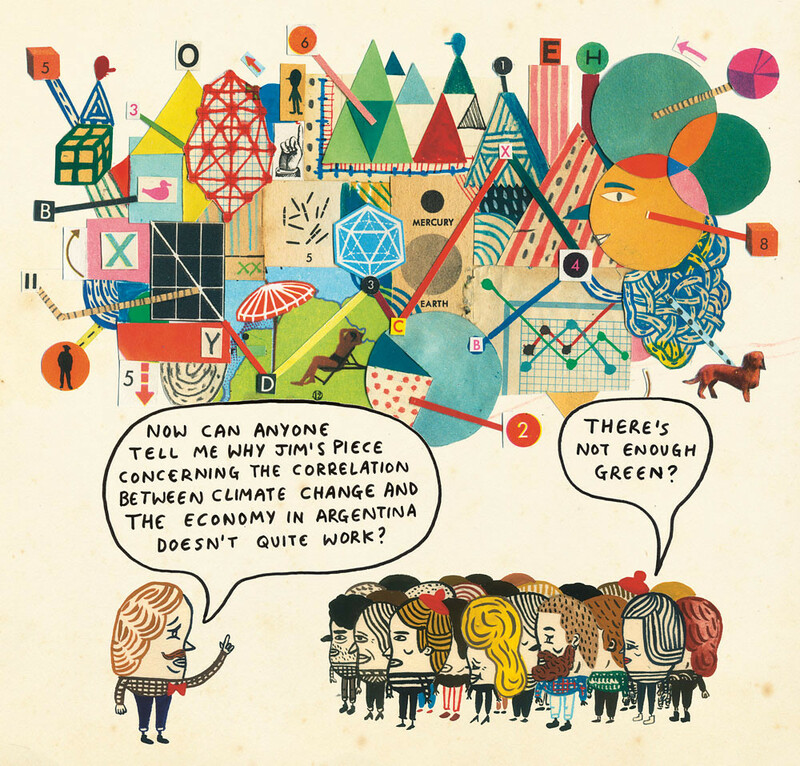 Climate science, economics and genetics all present us with problems that are solvable in part through the right visualisation of their complexity. Think how the film ‘An Inconvenient Truth’ brought the detail of global warming to life and allowed Al Gore to tell his story without baffling people with numbers. The world is changing rapidly. In the past, most of what needed to be designed was edited by the client before being passed over to the designer. Nowadays, the stuff to be designed is often raw data, unintelligible to many clients themselves. To work with this, designers must have some grasp of disciplines such as information architecture, data science and statistics. Yet if you look around the graphic design degree shows, it is obvious that the majority of students haven’t heard of, yet alone worked in, any aspect of information design or data-visualisation. This seems particularly short-sighted given the manifold benefits of setting information design briefs. While the rest of graphic design worries about falling budgets and crowd-sourcing, data-products – and those who can make them – are in demand. Look at Berg’s BBC Dimensions, which can demonstrate the scale of an event such as the Pakistan flood area or the Gulf oil spill by overlaying it on the user’s postcode, or its Schooloscope, which turns dull government data into a useful application for parents. Stamen’s Mapumental for Channel 4 changes how we use local cartography and its Eddy tracks Twitter activity for MTV. Start-ups and traditional companies alike are aware of the need for a usable – possibly even delightful – window on their data. Yet this growth area is ignored by most design degree courses in their formal programming. Information design briefs force students to look at the subject to be communicated, rather than obsessing over an instant stylistic fix. The link between the content and its form is obvious in these briefs – any ‘solution’ that ignores the content is accordingly weak. Forget ‘problem solving’ – let students learn to articulate the problem first. Christopher Alexander, the author of ‘The Timeless Way of Building’ (1979), an architecture book that has influenced many other fields, defines a designer as an egoless ‘medium’ who works by understanding and harnessing the forces around a problem. Information design briefs demand this explicitly. There is no room for ego when understanding is the priority. Confidence with the content leads to better relationships with the clients and better solutions. I am staggered at how many designers do not understand the businesses whose work they represent. They then wonder why the clients treat them as ‘Mac men’. How many newsroom designers can discuss the significance of Balochistan to the 2010 Afghan conflict? How many designers of a broadcaster’s annual report could tell you about the world of converged media? Designers need the credibility of the boardroom and they only get this by understanding the boardroom’s business. But there are many cultural barriers to this subject being taught now and most come from within the design industry. There are plenty of visual stylists or illustrators who appropriate the aesthetic of information design to give their work authority. Many books on the subject are little more than visually appealing data-art masquerading as purposeful and understandable communication. The air of integrity sought by these faux ‘infographics’ is like ‘the science bit’ in shampoo commercials. This work seduces with allusions to purpose and process, like a child busily crayoning a piece of paper from top to bottom. As a result, students frequently find it hard to think past the visual layer. It is quite common for students to see ‘design research’ as a trip to the library to look for rare patterns or visual devices. If it does not occur to them that they do not understand the audiences, context or business goals behind briefs – don’t blame them, blame lazy teaching and directionless briefs. And pity the poor tutor trying to encourage interest in proper design role-models when the design media focus on celebrity designers, who rarely have the level of insight to match the column inches required. Visions of singular genius are not helpful to those who will need to collaborate with many. Anecdotal and subjective musings inspire only egos, where instead insight is required to encourage the intellect of impressionable students. The solution lies in changing the structure of courses and devising decent briefs. Design courses should acknowledge the vocational disciplines within visual communication and teach accordingly. Graphic design should be solely a course label, with titles that are agreed across the entire discipline. A ‘visual stylism discipline’ should concentrate on the motifs sought by art-directors and corporations. Motion designers should learn about narrative arcs and storytelling. Information design modules will teach understanding and accessible communication. These modules should celebrate their differences and individual skill-sets rather than the ill-defined, soupy ‘visual communications’ tag. This is a banner for studio-ready generica. Most self-initiated projects have the substance of a napkin and look to fashion to provide their meaning. This is no way to prepare talented young people for a world that gets less welcoming with every slew of graduation ceremonies. The information design brief needs some thinking, too. I would do a basic print brief to expose basic Tuftian graphic issues, followed by a second digital data brief that explores the specific needs of audience focus, designing with data and interaction design. There should be a real end result – a charity poster, a civic architectural work, a digital news story – to concentrate the mind on the end-user. The tutor should provide the data for presentation. Some will argue that students should initiate research themselves. I believe that if they are given some relevant data, they can always find more. And, besides, they are students and this will all be quite new to them; they need a steer, not more ‘self-direction’. It need not look like double maths – the tutor should be able to weave in enough poetry to entice students. In short, information design should be a compulsory part of every graphic design course. The student will benefit from better analytical skills and a sense of the methods and materials of the modern workplace. Information designers bridge many of the new economy’s disciplines and will be well placed for work and influence in the coming decades. Max Gadney is curating ‘The Design of Understanding’ conference at St Bride Library, London, on Friday, 28 January 2011. Top: illustration by Nick White / Heart.